for my Girls Gotta GetAway weekend? 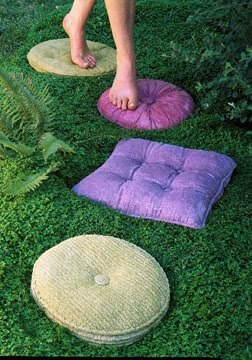 They are concrete stepping stones for your garden! I do not know about you, but I feel like it just appeared out of nowhere. At first I'm like, do I care? I took this picture on my last visit to Jimmy's. I recommend the caprese panino or the cuban sandwich! These were also served on Mother's Day! Note: I buy boursin cheese at Costco. You get 3 boxes for approximately $7.99 versus regular supermarkets carry it for about $5.99 - $7.99 per box. in her new book, "Lulu Powers - Food to Flowers"
could grow into this table??? Thanks to Wendy for taking pictures for me so I could play hostess. I especially LOVE the staging of the HOT trivet behind the lasagna!